BUSINESS OPPORTUNITY - Make Money with Our Nutrition and Health Online Business! With so many tempting options it can be confusing and risky when trying to select the right Business to become involved in. The business opportunity that we offer and promote, ties right in with the dance and fitness industries. So, if you have an interest in dance and healthy living like we do, then this is a great business opportunity for you! We understand that there is a growing movement toward health and leisure, and this business in definitely expanding and highly in demand. We are looking for like minded people with a passion for health and wellness, to join us as business partners in promoting healthy living through the USANA Nutritional business. The USANA nutritional supplement products are endorsed by leading scientists, doctors, business leaders, top professional sportsmen and women including Olympic champions, and this expanding business is producing millionaires all over the world. These endorsements back up our confidence and passion for the business. We will show you how you are rewarded for your passion, belief and efforts! You are promoting the highest quality products using a proven business system which can generate huge amounts of residual income! Expanding Business. We need business Partners! And, as you will see, many people are making a lot of money out of this exciting business opportunity! This business is highly relevant and appealing in today's health conscious world, especially with the economy in the worst state in over 70 years, and with so many people looking for a way to get ahead in life. Remember, more millionaires are created in recessionary times than any other period, so now is the time to get started in your own business. Please contact us for more information or to get started by clicking here: business opportunity page. To Find Out How to Make Money, This is what you need to do! b) Compensation Plan - How you make money! Of Course you can always call us at any time on +44 7-482-914-458 and we will be more than happy to help you with the information you require. And, this business can be set up all over the world! BECOME AN AFFILIATE - REFER STUDENTS AND MAKE MONEY NOW! In addition, we are world class entertainers and performers, so please promote our entertainment services and again we will pay 20% commission on any brokered deal for us to perform, subject to agreement on price. 1. You register as an affiliate by becoming a member of the Stephen Thomas Dance website. 2. 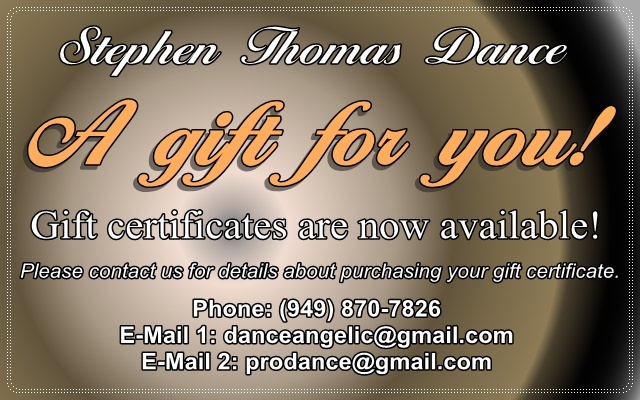 Your contact browses the Stephen Thomas Dance website or contacts us, and may decide to enroll as a student or hire us for entertainment. 3. If a visitor becomes a paying student or hires our services as entertainers, and is referred to us by you, the payment will be registered as a sale for you, and you will receive commission for this sale which is 20% of the lesson tuition fee or entertainment services fee. Please visit the Members Login page and enter your username and password to contact us to advise any referrals you may have. For any questions, please email or call me at 949 870 7826. Cold calling, Mass Door to Door Leaflet and Flyer Drops, Placing Flyers on car windows, Mass E-mail Blasts, Internet Marketing, Mass SMS Text Messaging, Website Links, Directory Listings, Side walk and Curbside Signs and Banners, etc.